I have always been captivated by fairy tales. As a very young child I had a book, the Ladybird Cinderella, and to this day this fairy tale remains my favourite. The idea that something magical can happen to someone utterly ordinary, that they can dare to dream, and that dreams can come true, the idea that they can overcome cruelty and persecution is something that makes me feel happy. And, really importantly, that in doing so they remain true to who they are and who they have always been. Then we feel they deserve the ultimate prize. But fairy tales also have always had the potential to shock and instruct. They can be harsh. And the fate of the protagonist isn’t always a ‘happily ever after’ one. That element of peril, combined with the unknown, with a dash of the magical thrown in make this three-part cocktail both captivating and thrilling for me and many like me too. It’s a potent and breath-taking journey into who knows what. A few years ago I met my publisher, Little Tiger, on a wet windy afternoon in London to talk through new ideas for a picture book. I have a number of pets at home, and my daughters have had countless small fluffies over the years, and I knew I wanted the book to have something to do with pets. Sure, they can be cute I thought to myself and I knew that first-hand too. But anyone with pets will tell you that they require lots of time and commitment and, however hard you try, sometimes you feel like the little darlings have the upper paw over you! After much discussion (and more meetings) we finally hit upon the idea of not just ‘ordinary’ pets, but pets from traditional fairy tales forming the cast of the book. But why did they come, and who indeed wanted them? Those were the next questions we had to answer. Well, I decided the ‘who’ would be poor, unsuspecting Bob. And the why – was because Bob was broke. He needed a job. He had a dog, Rex (who was friendly and smart and hardly ever made nasty smells), and so Bob assumed all pets would be like Rex. The obvious new job for Bob, as he loved animals, was to become a pet-sitter. The town had a plentiful supply of pets after all, and so why not? 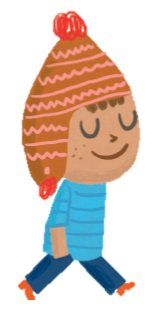 Easy Bob thinks. Right? Um, no – bad move! I do love to challenge my characters; really take them out of their comfort zone. Stories need problems to solve, dilemmas to overcome. They need jeopardy and the reader needs to feel the same empathy with Bob as I had with Cinderella. I need them need to root for Bob. In short, I need them to care. Poor Bob! He doesn’t have it easy, but no one can say he’s not a trier! There are so many fractured fairy tales on the market today, I needed my story to not be just another one of those, but different, with an original fresh take. This was why I decided to focus on the pets, and certainly not ordinary ones. No, these are fairy tale pets – all waiting to be dumped by the characters who in the original fairy tales met them for the first time. Now Goldilocks cannot wait to get shot of stroppy Baby Bear who she passes off as a ‘little poppet’ before skipping off double-fast. Yeah, right! And it’s funny to see what the pets do when their ‘people’ are off on holiday. Poor Bob and Rex – they’re run ragged – before, that is, the three little pigs' ‘puppy’ (someone is telling porky pies again!) huffs and puffs and blows Bob’s house down. #Truefact. I also wanted the story to have a fun twist at the end and to give the reader and the teacher a potential starting point for a whole new story. For when Bob plants Jack’s beans thinking nothing can go wrong this time, he doesn’t, of course, imagine who might be sitting at the top of (and wait - now he’s coming down!) the beanstalk! This book has so much potential for work in the classroom; comparing contrasting original/contemporary fairy tales, giving normally ‘quiet’ characters a strong voice, and the possibilities for imaginative role play are endless. 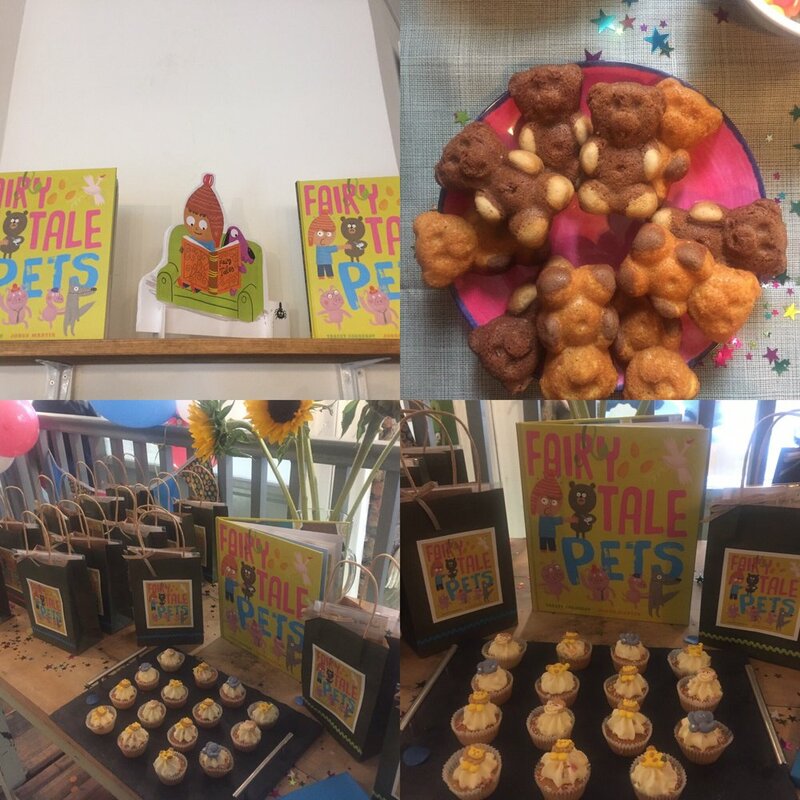 A 'Fairy Tale Pet Care Centre' in a corner of many classrooms beckons! This week the book was finally published. 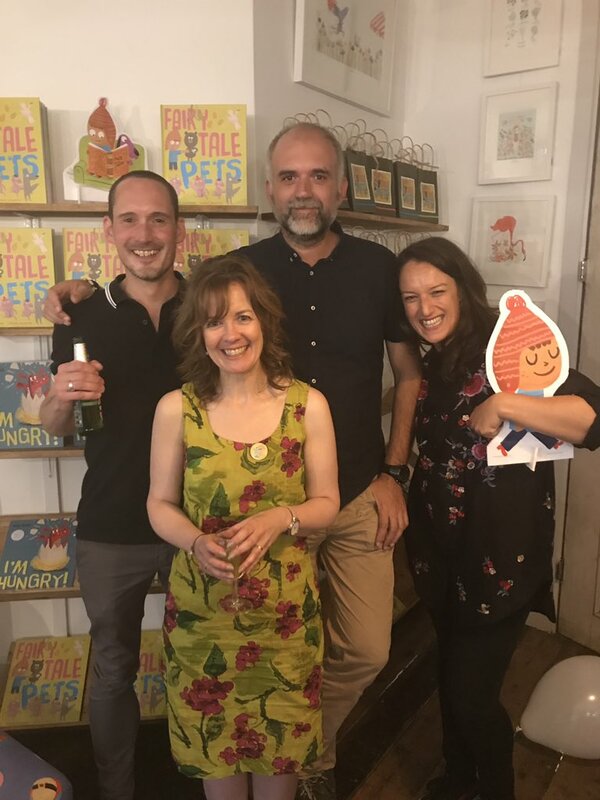 It started off with a really fun launch party in the Bright Illustration Agency in London. The illustrator of 'Fairy Tale Pets' is the very talented Jorge Martin, and the moment at which the illustrations were added to the text was a magical one for me, for then the characters really started to come alive before my eyes. The illustrations are full of energy and character and Jorge admirably brings the fairy tale chaos to life in a fizzing vibrant palette of limes and turquoises and raspberry pinks and retro browns. I love it! Little Tiger have been so great at giving the book a really fabulous start. The take-up has been so great – we had to reprint even before publication date and I couldn’t be more thrilled. But even more thrilling was seeing the response of the children we’ve performed the story to this week. Beth Ferguson (my publicist at Little Tiger) and I have been seen hundreds of children, made countless stroppy Baby Bear glove puppets and sang the 'Poor Old Bob, he Needs a Job!' song with so many children. 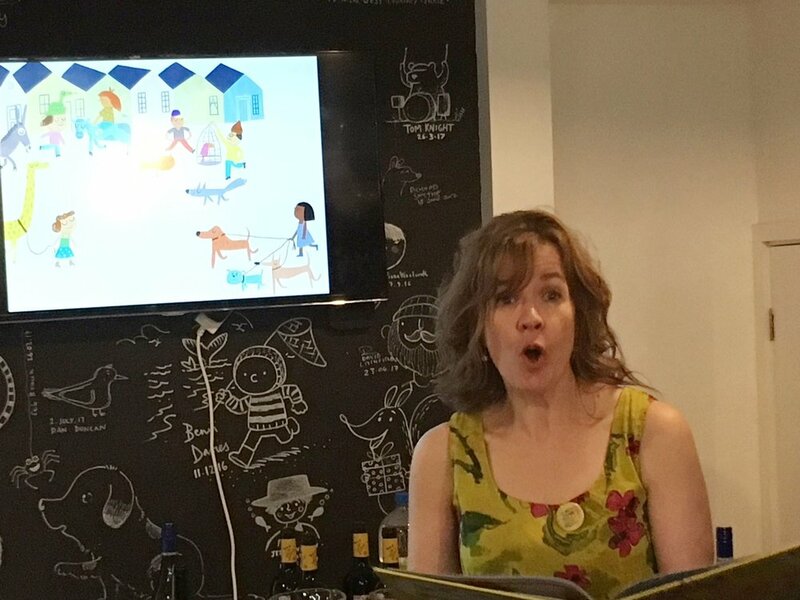 We also went into Evelina’s Children’s Hospital in London on the day the book was launched and spent an afternoon with the children and staff there. It's an afternoon that Beth and I will remember for a very long time, and hopefully one that the children will remember too. Many thanks to my publishers, the hospital school and the wonderful 'Readathon' organisation for making this happen. So anyway, I really hope you’ll enjoy the story and that Bob and Rex will become two characters you’ll take to your hearts. Time to let the fairy tale chaos begin!